If you want a night out dancing and drinking with friends and meeting some new people, these clubs in New York are where you need to be. With the best bartenders, the best DJs and the bets atmosphere you can't go wrong. From jazz clubs to dance clubs and more this guide has something that is just right for you. Listen to the finest jazz at the best jazz clubs in New York. 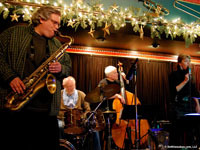 Find the top jazz clubs in NY that music lovers will adore. Enjoy a memorable night on the town at one of the best jazz clubs in ny.